Thank you everyone who joined us this month for our LOVE challenge. There were so many AMAZING cards. Check back tomorrow for our new February Challenge and another chance at a $25 shopping spree to the One Crazy Stamper Store! 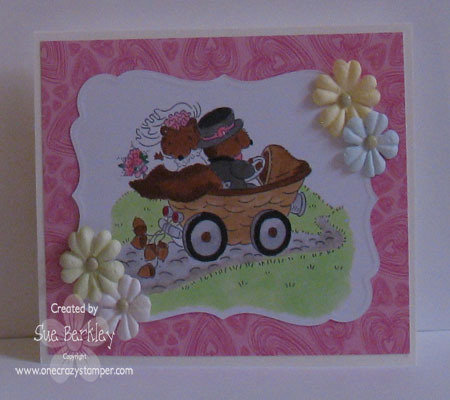 For this last post for January's Love Theme, I'm using the Wedding Squirrels from Stampavie. 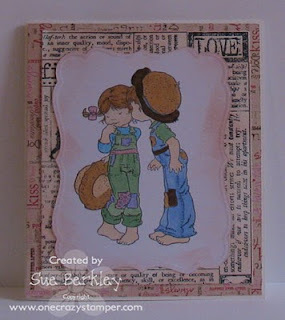 There is only today left to enter the Love challenge at One Crazy Stamper Blog. brand new challenge for February which is Make It Pink. Have you entered our challenge yet? it's almost time to pick this months winner so make sure you get your submission in! I had to get one more love card in although with next month being the love month you might see tons more! I had to use my Kraftin Kimmie Goldilocks because she is just so adorable and obviously loves her teddy bears! I wanted something a little non traditional for love so I did green, yellow, and blue. I'm going to keep this short tonight because it is FREEZING here. I know all of you crafty people with snow and below zero weather are laughing at this cold California girl but I swear I am shivering! Happy crafting and thanks so much for all of your wonderful supportive comments on our blog! 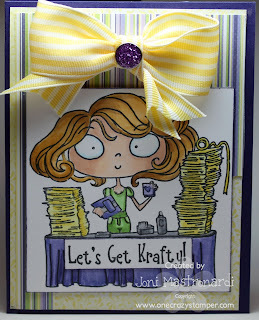 Supplies: Stamps: Kraftin Kimmie (Goldilocks), Sentiment is Kraftin Kimmie Josephine Copics: C1, E00, E53, E31, YR24, E43, E30, G94, R20 the ribbon and design paper is from my personal stash. January has been the month for our "love" theme. Well I do love stamping and scrapping. When I first saw this Krafty Kimmie stamp, Krafty Stamper over at One Crazy Stamper I knew I had to have it! I finally got to play with it and thought wow this would be perfect for our "love" theme! I stamped the image with black memento ink and I colored her with many copics. My paper of choice for coloring with copics is Xpress It. Dp and ribbon are from my stash. All products mentioned are available from One Crazy Stamper. Just a quick reminder that you have 2 more days to join in our "love" challenge and be in the drawing for a $25 gift card to the One Crazy Stamper Store! I am making this card in hopes that it will force Spring along! Don’t forget to play along with us on our February Challenge! 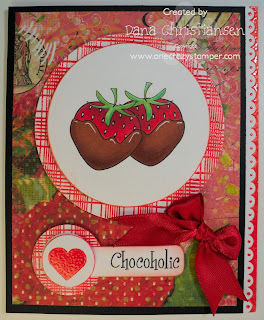 It starts on the 1st over at One Crazy Stamper Blog. February’s challenge is gonna be so much fun and not only that I will have a tutorial that will just get you into the creative spirit! In keeping with the January “LOVE” theme at One Crazy Stamper, I chose the Magnolia Stamp called “Loves Me Tilda, available at One Crazy Stamper now, for a price that can’t be beat. Note: After I had stamped the image I realized I had forgotten to stamp anything for her to sit on, so I used my X-acto knife to cut her legs free, and slipped the reconstructed stool under her. Whew! 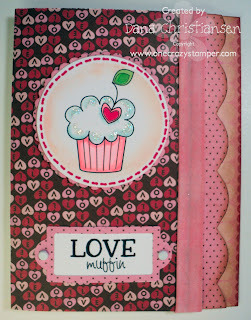 One Crazy Stamper “Love” challenge. Dana here, and it's my bat at a tutorial. You will get to know me better as we go along but you will learn that I have an obsession with Copics. I will, on the rare occassion, use another medium but I must admit, those are rare and far in between. I like to "discover" new ways to use my Copic markers. This tutorial highlights the original method I used with my Copics and the way I am doing them now. The stamp is "Country Girl" from Sarah Kay (Stampavie). She was stamped with Memento Ink and colored with Copics. I used three different shapes of Nestabilities, the Circle, Lacey Circles and Fleur De Lis. Don't forget... you still have a few more days to enter our Love Challenge! Happy Monday! I'm back after a brief blog break, thanks to all who left a note of condolence on last Monday's post, I appreciate it! Today I'm posting one more card that fits our January challenge! The theme is LOVE this month....so show us what you love!! There is a $25 gift certificate on the line, you won't want to miss this!! My card today is pink...and not really a lovey-dovey card, but a remembrance card or a card you could send to a girlfriend. I colored Stampavie's Spring is Back image with Copic Markers. One thing I love is pretty paper, and this Bo Bunny Sophie Rae paper is beautiful stuff! 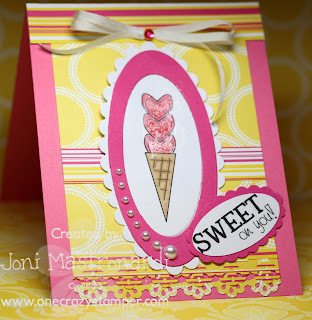 I used the pink side as my card front, and I cut out elements from the reverse side to make embellishments for my card. 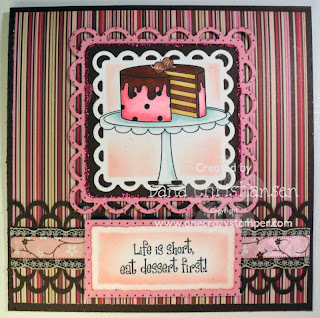 I added a touch of dimension by using Cuttlebug's Victoria Embossing Folder. 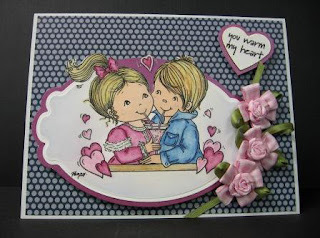 In continuing with this month's theme of Love at One Crazy Stamper, I used A Kiss for Chloe by Stampavie and Life Defined by Whimsy Stamps. 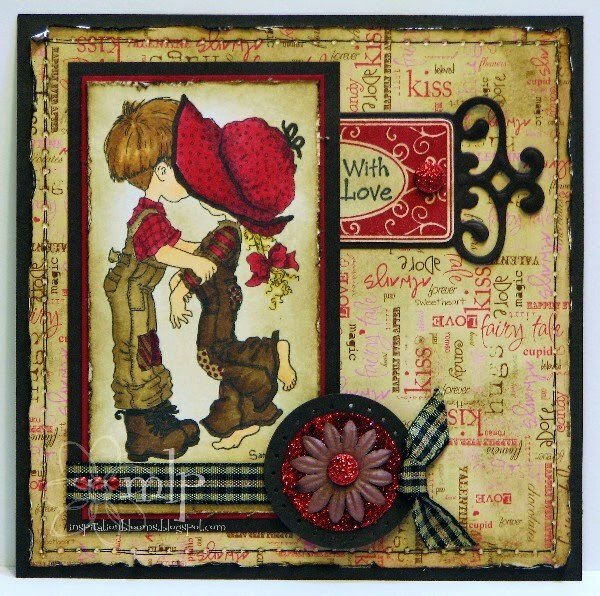 I distressed the image and designer paper with Tim Holtz distress ink Tattered Rose. Everything can be found at One Crazy Stamper. You have until the 30th to submit your card for the challenge, so play along. I used Cheeky Beauty for today's creation. The images are so much fun to color and are perfect if you are learning and practicing your shading and coloring technique with copics. I also used Stickles cotton candy for the shoes and crown. I used oval nestabilities and also kept the die on the paper to sponge the image. This makes a nice frame. If I haven't said it enough I really, really, really love these images! And thankfully you can find them and way more at One Crazy Stamper. 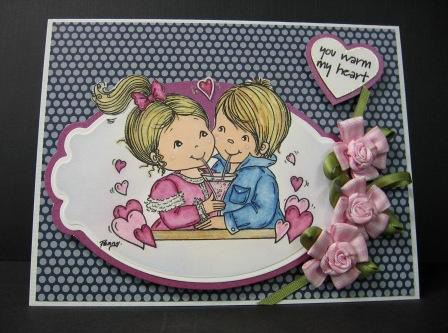 In keeping with our January theme of "love" I have chosen the Stampavie stamp set: Eloise and Mimi Saying Hello. What better way to express love than two friends and a puppy saying hello. I colored the image with copics. See picture below. Yes I did use quite a few for this card. I stamped my image with Memento black ink on Copic Xpress It cs. I cut out the focal image with my label 7 nestie. All products are available at One Crazy Stamper. Cs is from my stash. Check out our challenge this month on our blog! Happy Thursday Folks! Good news is we are only 2 days away from the weekend! Once again we are getting a snow storm. We are only suppose to be getting up to 5 inches, but from what I see we already have that. But who am I to complain, it just gives me an excuse to check out One Crazy Stampers new line of Magnolia stamps and play with my stamps :)! My order from One Crazy Stamper came today – and in it, the Fanciful Flourishes Set. When I looked at the stamp set, the technique that came to mind was one that we learned from an SU Stamp Club and created by our uber-talented Cheryl. She is amazing! Please forgive my photography for this one – the sponging looks so white, but in real life it is quite vibrant. This one seemed to be the least washed out. My card is 5” x 5” using SU cardstock: Navy, Black, and Whisper White. Another layer was blue glimmer paper from an unknown source. I stamped the White with elements from Fanciful Flourishes in Black Stazon . Note: (remember when using Stazon with acrylic stamps – clean your stamps right away with a good stamp cleaner that will condition your stamps). I then sponged the squares with Faded Jeans and Antique Linen Distress Inks. The heart was stamped in Broken China and covered with Glossy Accents, sprinkling clear glitter on it while still wet. 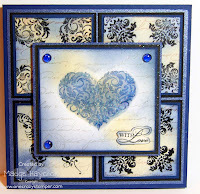 I stamped a script stamp onto the white sponged pieces with Pumice Stone and layered. 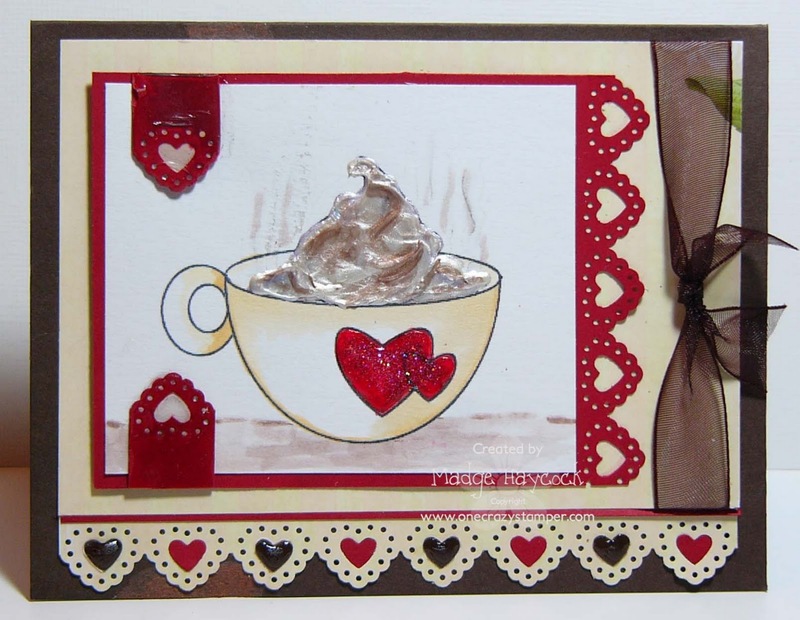 The “With Love” sentiment, from the set, was fussy cut and sponged to give dimension. I added 3 clear Dew Drops, which were coloured with Copic B39. Hope you’ll give this technique a try – it has a very vintage dimensional look. Our theme all month for our Challenge is "Love". What says love more than Chocolate? Even better, how about chocolate covered strawberries? That's what I have to share with you today from Your Next Stamp. Yummy, huh? This was so quick to color with my Copics after stamping with my Memento Black Ink Pad. The Circles were all cut with my Nesties. You have all month to join our challenge. All you have to do is follow our current theme! I can't wait to see what everyone makes. I have to confess, it's a nice change after all the Christmas cards!! Today I'm sharing a card that I hadn't planned on sharing today...but we lost my grandma today, and I just needed tonight to remember and be thankful for all of the special times we shared. I'm not sorry for the hugs we shared, or the memories we made...hug someone you love today and tell them you love them while you can!! This card is one I made using a new stamp set that I just received from http://www.onecrazystamper.com/. 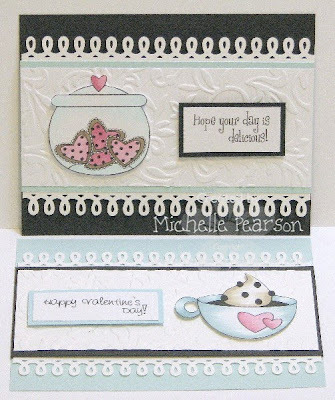 This set is called Fancy Accents SDS stamp set, and it is made to go with the Spellbinder's Fancy Tags Dies. The red swirled rectangle/oval frame is from this set which contains 9 compatible shapes and 6 comptatible sentiments. I'm going to LOVE this set! I used a Stampavie image and colored it with Copic Markers. 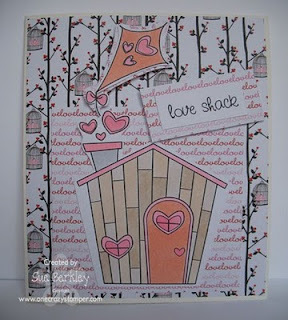 The designer paper is from Bo Bunny's Crazy Love collection. I distressed my image and designer paper with Tim Holtz distress ink, in Walnut Stain. The glitter circle was punched out of red cardstock, run through a Xyron sticker machine and then glittered with Art Institute glitter. 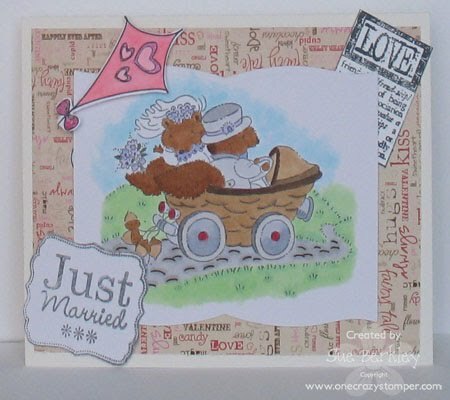 is the Wedding Squirrels by Tina Wenke for Stampavie which can found at One Crazy Stamper. Copic Markers: Tires: N0 - Neutral Gray No. 0, N1 - Neutral Gray No. 1, T6 - Toner Gray No. 6, T8 - Toner Gray No. 8; Tux: T4 - Toner Gray No. 4, T8 - Toner Gray No. 8; Flowers: RV21 - Light Pink, RV23 - Pure Pink; Car: E0000 - Floral White, E31 - Brick Beige; Squirrels: E35 - Chamois, E37 - Sepia; Walkway: W3 - Warm Gray No. 3, N0 - Neutral Gray No. 0; Grass YG11 - Mignonette. All supplies can be found at One Crazy Stamper. You still have time to enter our challenge for this month. The theme is "Love". If you haven't noticed yet I am completely, hopelessly addicted to Kraftin Kimmie and honestly I wouldn't have it any other way! I love the moonlight whispers collection and I am super lucky that Lora over at One Crazy Stamper has tons of the connection available and she also has the new release stamps as soon as Kraftin Kimmie releases them! How cool is that! ﻿I used Kraftin Kimmie (Goldilocks) and of course colored her with copics. I used my sewing machine to stitch around the image and I distresses and wrinkled the edges. Ranger Distress stickes in Spun Sugar to the hearts. Copics: RV10, RV11, RV13,RV14,E31, E35. All of the supplies used today are available from One Crazy Stamper. A Cup of Cocoa for a Nor’eastern Day! Yes folks, we are getting nailed today! School cancelled, lots of places shut down. Looking at this makes me want a cup myself! So if you haven’t heard already One Crazy Stamper has gotten in their new line of Your Next Stamps. They are absolutely adorable! So if you have a chance, check out the new products just coming in and the great sale prices! Meet “Siku and Shiya” two little Eskimo children (I’m assuming that they are Eskimo, forgive me if that is politically incorrect). 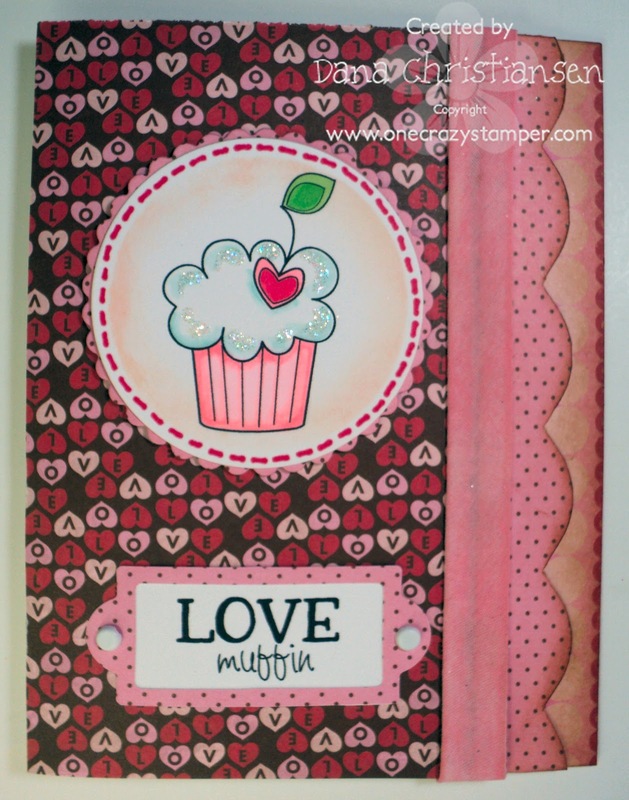 When I first saw this stamp at One Crazy Stamper, from Stampavie, I knew exactly what I wanted to do to fit perfectly into the “LOVE” theme for Jan. at One Crazy Stamper. My card measures 5 1/2” x 4 1/8”. I used copics R00, R20, E21 R24, R28, B00, B66 and B69. 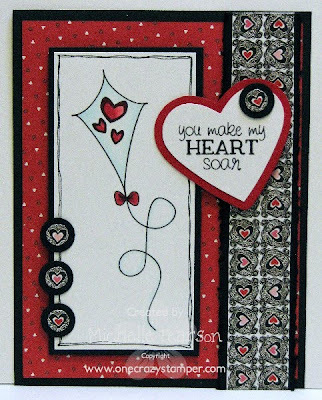 Also used C0 and C4 for shading and Tim Holtz distress inks (Broken China and Tattered Rose) for sponging around the heart. The surprise is the way the card opens – it “breaks open”. 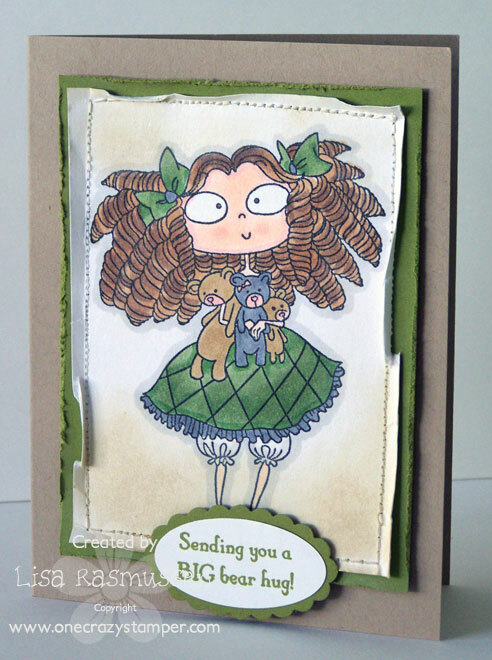 The tutorial for a Break-a-way Card can be found on my blog. Follow the link to enter the challenge at One Crazy Stamper for the chance to win a fantastic prize. Your Next Stamp - "Dessert First"
I have another wonderful stamp from Your Next Stamp. This was so quick to color with my Copics!! I just love it! 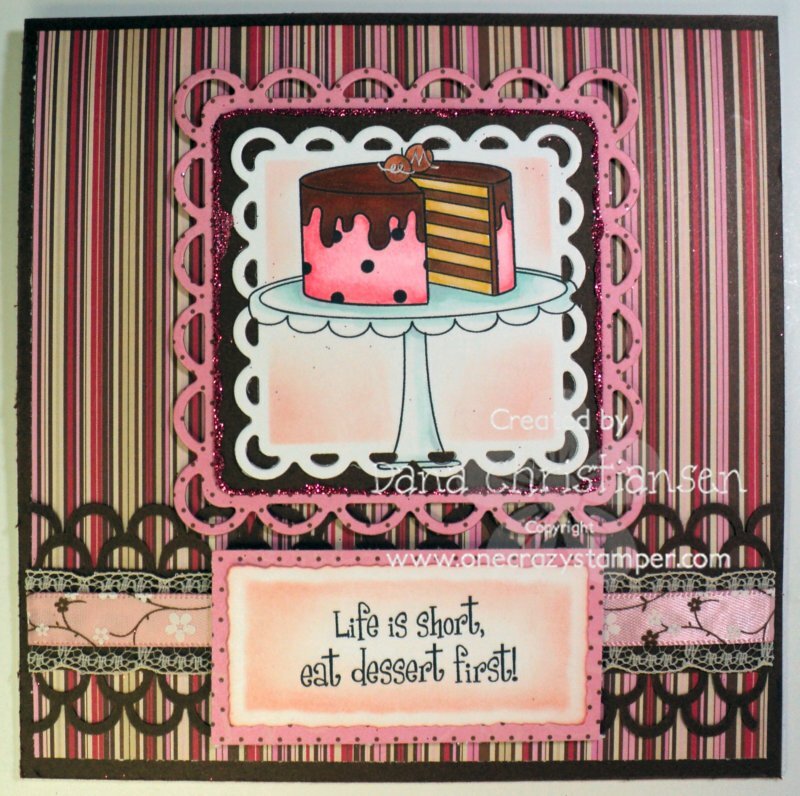 I cut the borders with my Nestabilities for both the main image and the sentiment (which is very good advice..lol) Those luscious papers are from Bo Bunny's Crazy Love Collection 6x6 Paper pad. I just love pink and brown!! You still have plenty of time to enter our challenge this month. Just follow along with the theme of Love! I can't wait to see what you create!! 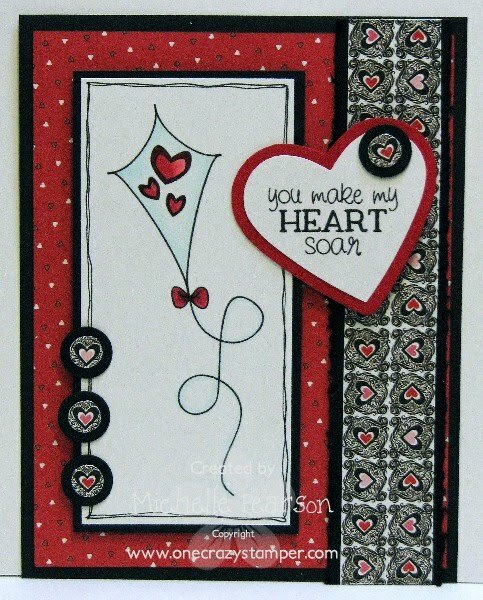 Today's card uses the new stamp set You Make My Heart Soar from Your Next Stamp! I love the clean simple style of these stamps, they are great to color with Copic Markers! I used the 6x6 Bo Bunny Crush Collection for my designer papers. I punched out some hearts and made my own embellishments. The images are popped up on foam tape. 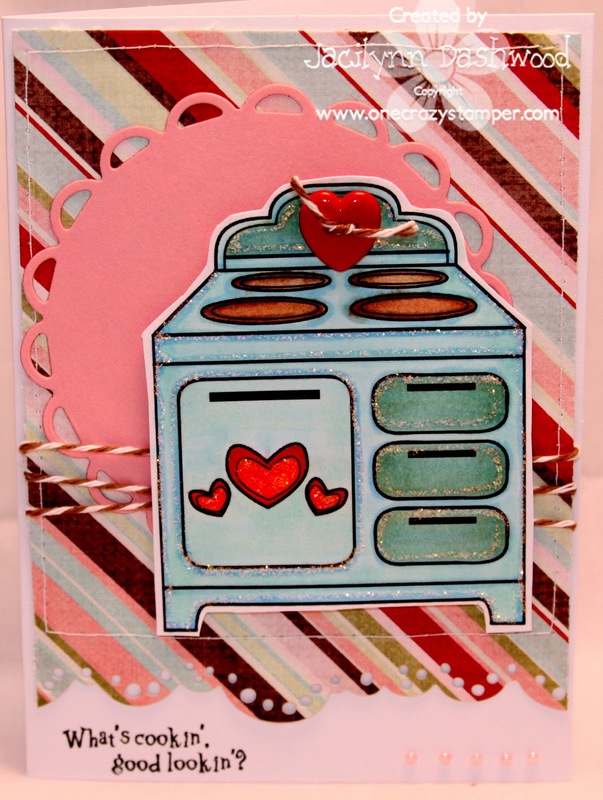 For our January's Love Theme, I decided to use A Kiss for Chloe which was created by Sarah Kay for Stampavie. Sarah has an enduring line of stamps which can be found at OCS. 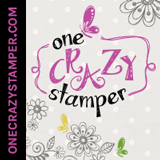 Everything and more can be found at One Crazy Stamper. 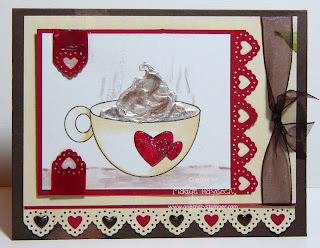 Come and have some fun and play with us for January's Love Theme Challenge. You have until the end of January to submit your card. Awhile ago I saw a really cool black and White/sepia copic tutorial and this stamp just screamed retro to me. I really wanted to try to make this look sepia colored with black matting like the older photos. It was VERY easy to color this way once you had the right colors. for the black and white photo look you need to use copics but all the grey C's and if you want the sepia look you use the gray W's (that's warm and cool tones). For this I used all of the W's (W1, W3, W5, W7) for the skin I used E43, E41, E43. these are pretty light earth tones and really help keep the look. I used a scor-pal to make the grid on the background and some pretty kaiser rhinestones that are colored pink to give a hint of color. ﻿The sentiment says with all my heart so I think this card really qualifies for this months "LOVE" challenge. Have you played along??? This theme is really fun because love cards just make people happy! You have until the end of February to enter so hopefully you found some fun inspiration! Thanks to all that played along in our first ever challenge! We were blown away by the number of entries and the amazing projects! This month we have a new challenge theme for you... LOVE. And a very special line up featuring Your Next Stamps New Release!! Thanks so much Karen for providing the stamps to the DT this month!! One lucky participant will win a $25 gift card to the OCS store. We have 2 wonderful Guest Designers this month! 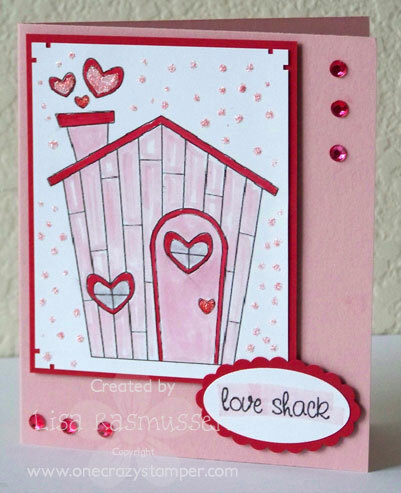 !﻿ Welcome Lisa this month as our Guest Designer. 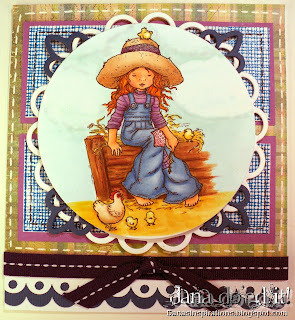 She made this gorgeous card using Magnolia Tilda with Apple. 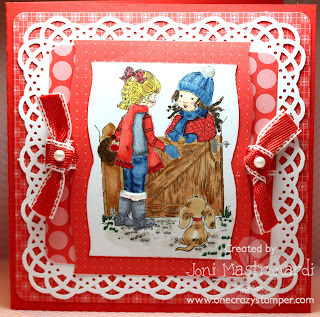 Also welcome Patti as our January Guest Designer. 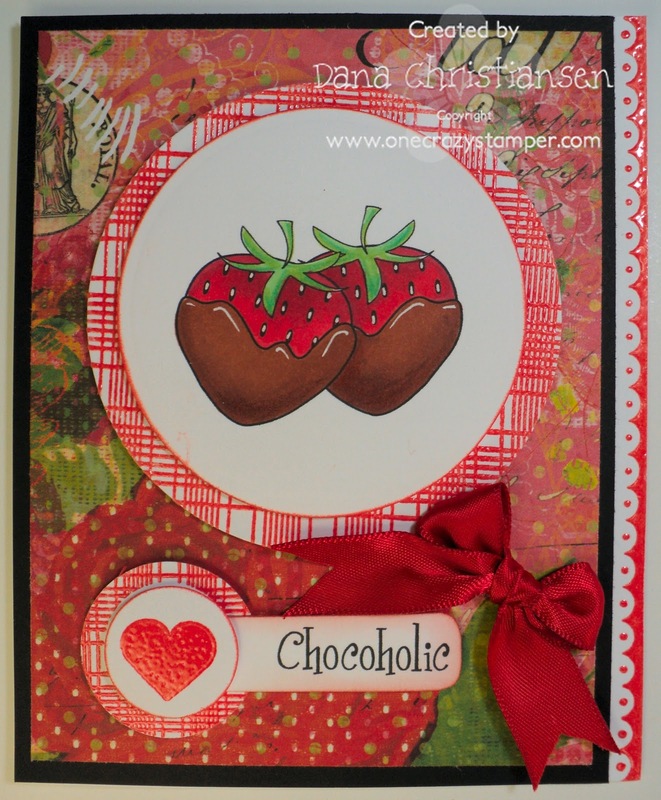 She used Stampaive "Love Bubbles" from OCS store. 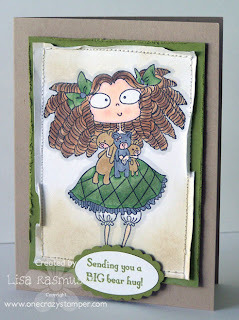 Please stop by both these gals blogs and leave them a little love, they have made some gorgeous cards! And now for the regular DT using some brand new YOUR NEXT STAMPS! Today I have a new stamp for you from Your Next Stamp. I have colored the muffin with copics. I cut out the focal image with a circle nestie and let the leaf extend out of the circle. I then layered the circle nestie with another circle and then the beaded circle nestie. 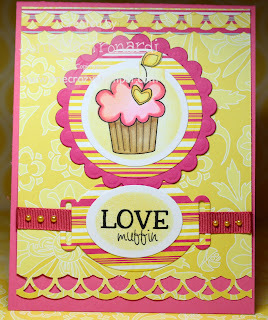 The love muffin sentiment is cut from an oval nestie and layered on the tag nestie. Copics: Y13, Y 18, FY1, RV10, RV11, RV13,RV14,E31, E35.